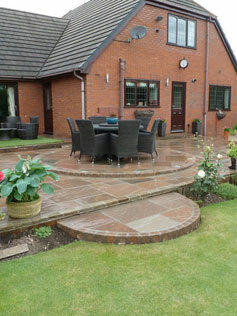 When planning and installing a garden, ideally you want to start with as an adaptable area as possible. 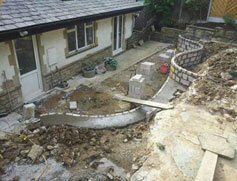 However there will always be some restrictions, whether that be size or shape. 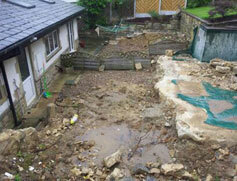 This project began with a hole in the ground where there had been a swimming pool. 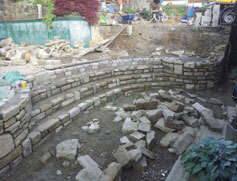 The multi-tiered project was built on layers to accomodate the original features and to create steps and terraces. 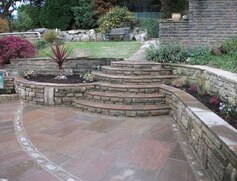 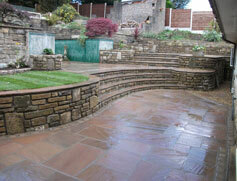 Products used on this projects were Marshalls Fairstone and Drivesys The Original Cobble. 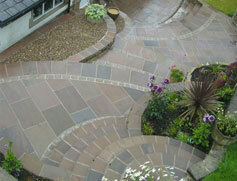 Random pattern of Fairstone Riven paving with large circular area also Drivesett kerbs used to create a border.